I grew up on baked apples. To this day, it is the only pie my dad eats. As such, I love the taste of sweet baked apples combined with a crunchy crust and a touch of cinnamon. 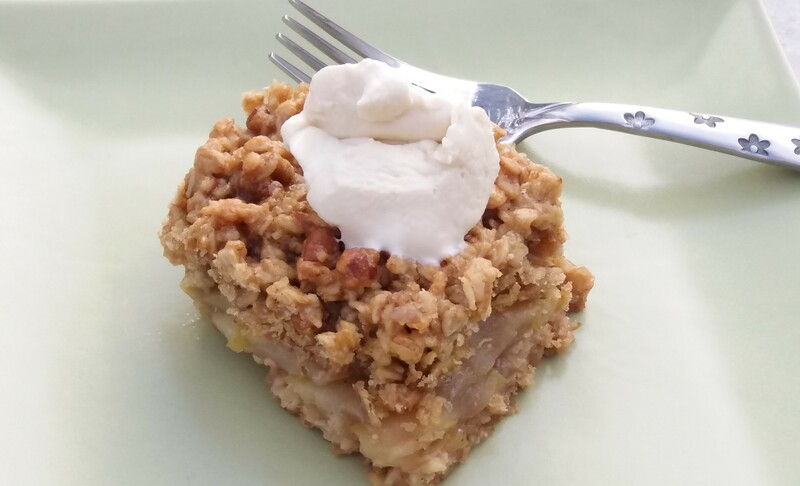 This apple crisp, a slight variation on the apple pie, is a wonderful dessert and will make your mouth scream for the next bite. Prepare the apples and place in a 6×10 baking pan. Squeeze the lemon juice over the sliced apples. In a large bowl, combine the oats, pastry flour, pecans or almonds (if using), and cinnamon. In a smaller bowl, whisk the oil, maple syrup and sea salt together. Add to the oat mixture and combine well using your hands. In a saucepan, place the diced apples, water, maple syrup, vanilla, salt and kuzu. Slowly bring to a boil, whisking continuously to ensure the kuzu dissolves. Once the mixture comes to a boil and thickens, about 2 to 3 minutes, remove from heat and add the lemon juice stirring thoroughly. Oil a 6×10 baking pan and pour the apples into the pan spreading evenly. Spread the topping evenly over the fruit and bake 20 to 25 minutes or until the top is nicely browned. Let cool for 15 minutes. Serve as-is or with a dab of cashew cream. Enjoy! optional modification: Some people enjoy a lot of “crust” and if you are one of these people you can create a version with the apple filling in the middle of two layers of crust. Instead of placing the apples in the pan immediately, place a thin layer of oat mixture on the bottom of an oiled 6×10 baking pan and then arrange the apples on top. Create the filling, pour over the apples just as above and then spread the topping evenly over the fruit. You will have enough oat mixture for this additional thin layer by increasing the oats to 2 cups, using an additional ⅓ of whole-wheat pastry flour, and adding an extra two tablespoons of oil and maple syrup.